Discussion in 'Recording/Live Sound' started by SRVYJM, Apr 17, 2016. Hopefully this will be a quick question- I have 6 amp heads (more actually but 6 for this question) and three cabinets. I simply don't have enough room for more cabinets to match a head to a cabinet for every head I own. Right now when I want to switch heads I unplug the cabinet from one head and plug it into another (with three technically available at all times). The struggle I have is getting behind my amp rack and cabinets is a pain, I have them all neatly arranged on a MetroRack shelf system and it's not on wheels (I should look into that though) or easy to move. I was wondering if I could take my three cabinets and plug them semi- permanently (unless I'm taking one to a gig, obviously) into a ¼" patch panel with the correct speaker cables and then have all my amp heads have speaker cables pre-routed up to the patch panel and plug in whatever head/speaker combo I needed without having to dig around in back and pull cables every time I want to play a different set of amp heads? Will ¼" TRS patch panels pass the signal through properly for speaker cables from the head to the cabinet? Any issues with Ohm loads when I go through a patch panel for ease of "patching" in speaker cabinets? I know I MUST have a speaker load on any amp head that is turned on, but will it hurt for that load to go through a patch panel? Also, the same question applies to effects loops for all these heads. Can I take my effects loop from my delay (for example) and run it into the front of a patch panel that's already wired with the cables to each head and just switch them out from the front of the patch panel instead of always having to pull them through the rack and into whatever head I'm using? I'm just thinking a patch panel would really clean up my studio cabling hassles and allow me to just plug and play as needed from the front of a panel with everything properly cabled from the back- down the rack shelf into the appropriate cabinet or head. Especially if I label everything nicely? Does this question make sense? I mean how do guys like Tim Pierce surround themselves with all those amp heads and have them all run down to a closet with a speaker cabinet without some kind of workable patch panels? All doable, but I would make my own, for the speaker cabs. An off-the-shelf patchbay probably isn't heavy-duty enough to work with speaker level signals. and load it up. Use 14G wire for the patchbay hookup and you should be fine. Probably a short evening's work, and it will be exactly what you need. MrTAteMyBalls and jmoose like this. 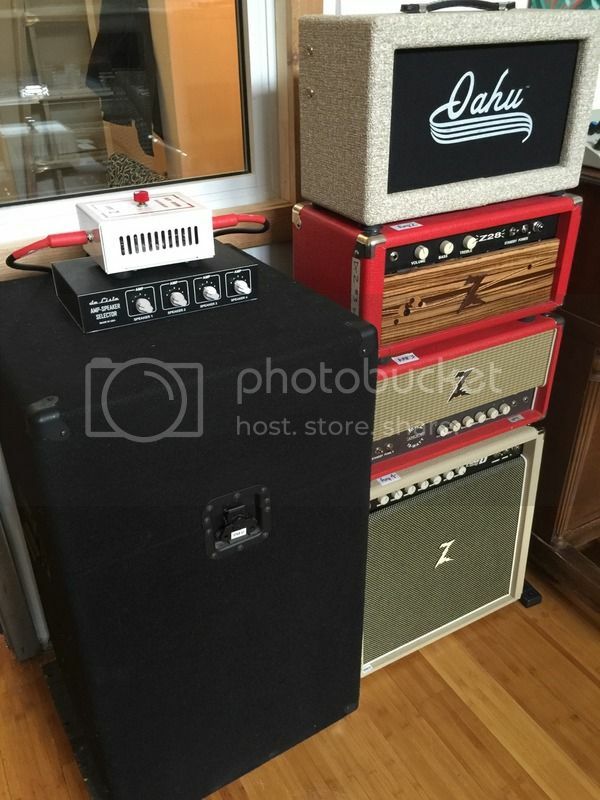 @lakesider mentioned an amp head switcher he's using in his studio that was pretty cost effective. I'll search to see if I can find it, or maybe he'll chime in. I've got 2 of the DeLisle speaker/Amp selectors at my recording studio. In this photo I have all 4 heads plugged into the box. I have 2 cabinets connected. 1 is the ISO cab w a 10" Gold (The Z Brake-Lite is in line) the other speaker I have plugged in is the 12" Blue in the bottom Z combo cab, there is also a Brake-Lite attenuator in line. Don't hesitate to call Jer DeLisle and ask him about the switcher. He can make you a bigger one if you like. It's super handy for me. I can access either speaker from any of the amps with out doing any patching. I can also run both speakers at once from any one of the amps too. jmoose and Crowder like this. SG1, Probos and buddaman71 like this. That speaker mixer is cool, but also overkill based on the OPs question, You can build a simple passive switch box with a rotary detent dial for about $20 in parts. use 1/4" jacks all around and ties the grounds and hots together (this way, you never have more than one speaker at a time). That mixing box is cool, but I am sure it needs pretty dense circuitry to keep the high wattage and impedance controlled to not allow an amp or speaker to blow out. But that DeLisle one posted above looks cool and is much less. As long as it supplies a load to the unused amps I think I'm sold. I would go with the actual head switcher or, build a patch panel out of blanks & "D" style jacks like Loudboy suggested. Those $100 1/4 patchbays from the music store might take the voltage, and not blow the traces clean off but they DO become highly intermittent with use and age. Not uncommon to have to wiggle the jacks once in a while and I'd be afraid of the 'no-load' syndrome. Its not worth the risk. Yeah, I noticed that afterward too- I was in a hurry. That's a huge pet peeve of mine, sorry you had to read through all that! Good answers and insight everyone, thanks for the replies! I'm definitely going to look into the deLisle box- that's pretty inexpensive- then build a "loop" patch bay as suggested. I don't change super often and having a loop patch bay allows me to have the delay in a stereo loop- which sounds massive and awesome in my studio. Now I'm thinking I might want to upgrade my speakers to a really nice old basket weave Marshall cabinet with V30's or something and if the deLisle can switch between a small number of cabinets I could narrow down what I have even more. I'm liking that route a lot. I like lakesider's rig because he can keep his speakers mic'd up if he chooses. Quick and easy to compare amp/speaker combinations and get to tracking. I agree- being able to switch speakers on the fly is a pretty nice feature and that unit is really affordable for what it does. I've reached out to them to see if he can build me a 6 amp 3 speaker version or something similar. Again, this is the kind of info I was looking for so thanks for the responses!